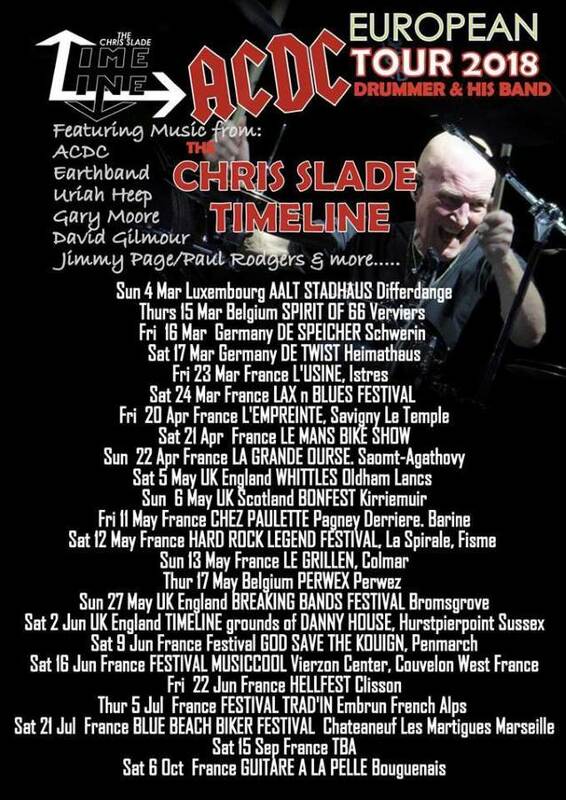 Duke TV has uploaded video footage of the April 20 concert by AC/DC drummer Chris Slade‘s band THE CHRIS SLADE TIMELINE, which finds him performing selections across his five-decade career. The clip, which was filmed at L’Empreinte in Savigny-le-Temple, France, can be seen below. Ever since AC/DC completed the tour cycle for its 2014 album “Rock Or Bust” nearly two years ago — a turbulent trek that weathered the forced retirement and eventual death of co-founder Malcolm Young, plus the departures of longtime singer Brian Johnson, drummer Phil Rudd and bassist Cliff Williams — fans have wondered whether sole founding member Angus Young would keep the band going. Although Slade decline to elaborate, ROSE TATTOO singer Angry Anderson said in a recent interview that Angus told him he is at work on new AC/DC music and intends to have GUNS N’ ROSES frontman Axl Rose — who took Johnson‘s place on the road in 2016 — sing on the LP. Johnson was forced to leave AC/DC mid-tour due to a dangerous level of hearing loss, while Rudd was dismissed following a drug arrest and Williams decided to retire. Angus has not said publicly what he has planned for the future of AC/DC.